HIIT, Tabata, CrossFit, kettlebells – all the fitness headlines seem to shout out the virtues of these types of killer cardio sessions in the name of efficiency and effectiveness. If you’ve been exercising regularly, chances are you are probably incorporating this type of maximum effort training into your regular routine (or maybe it’s the entirety of your cardio plan). And sure, HIIT and Tabata can be super effective, but are the only type of cardio you should be doing? The long and short answer? It depends on what your goals are, says Jeffrey A. Dolgan, MS, CSCS, an exercise physiologist at Canyon Ranch Hotel & Spa in Miami Beach, Florida. “The bottom line is that there is no one answer as to which combination of duration and intensity is best for everyone.” Dolgan says it’s important to remember that the length and intensity of your intervals has a huge impact on which energy system (anaerobic or aerobic) your body uses. Anaerobic training (any activity that causes an oxygen ‘debt’ in the body, typically only sustainable for 30-90 seconds — at most) is important if you are trying to improve your performance in short bursts. Tabata training, for instance, was originally created for Japanese speed skaters – and was perfect for helping them improve their ability to sprint. Keep in mind you probably won’t be able to do a true anaerobic Tabata interval with exercises like basic push ups – if you want to go anaerobic you need something to make you breathless and FAST (think explosive type moves like sprints, jumps, etc — the Tabata study subjects performed their intervals on stationary bikes to get their heart rates up as quickly as possible). Sure, you’ll burn up more calories in a short amount of time, but how often you should use this type of training still needs to be based on your overall fitness goals. Generally, anaerobic intervals shouldn’t be done more than 3-4 non-consecutive days a week, and that’s only if you are a very advanced exerciser and well rested. Aerobic training (activity which needs to be at least 90 seconds to be effective) relies on your aerobic energy system, which has plenty of benefits including improving your endurance and VO2 max. Your VO2 max measures the amount of oxygen your body is capable of utilizing within a one minute period, and is a great tool for measuring your overall fitness level and aerobic capacity. For most of us, aerobic intervals are the way to go, says Dolgan, who says aerobic intervals should be a minimum of 1 minute (3 is better) if you are trying to improve your aerobic capacity. Tapping into your aerobic energy system helps your body to maximize capillary and mitochondrial density, says Dolgan. And, it’s worth noting – even the subjects in the original, 6-week Tabata study didn’t just do Tabata training – they also performed about 70 minutes of steady state cardio training weekly. What’s the difference between HIIT, Tabata and regular cardio? HIIT, which is short for ‘high intensity interval training’ refers to a workout that alternates between the aerobic and anaerobic systems in your body with varying exertion levels during a specific, timed interval structure. HIIT training intervals can vary in length as the work to recovery ratio of the specific intervals may vary depending on your goals and fitness level (ie. you may start out with a 3 minute active recovery period and a 1 minute maximal effort work interval, and then eventually become fit enough to switch to a 3:1 work to recovery ratio). Pros: An efficient way to more calories in a shorter amount of time, creates a metabolic after burn effect which helps your body burn calories long after you finish. Cons: Requires your body to tap into it’s anaerobic energy system, requiring a lot of effort that can be challenging to maintain. Recs: 1-2 (3 if you are an advanced exerciser) HIIT style, non-consecutive sessions/week; resting fully in between sessions. 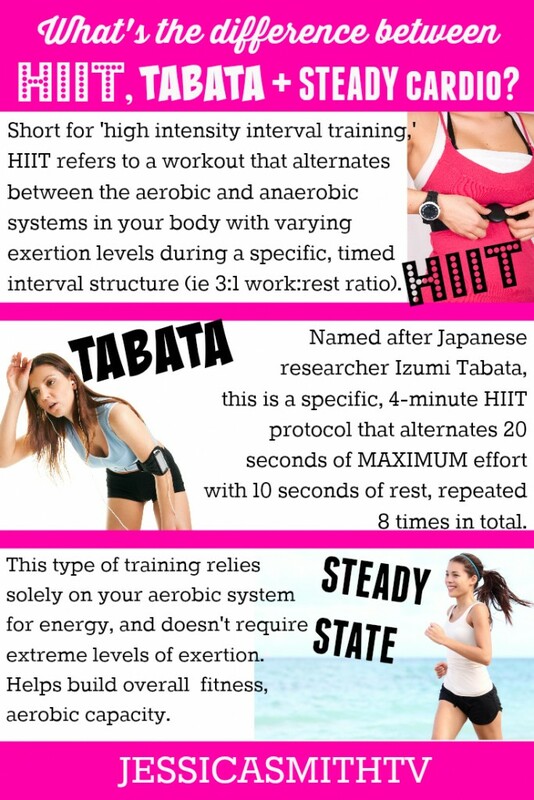 Named after Japanese researcher Izumi Tabata, this is a specific, 4-minute HIIT protocol that alternates 20 seconds of MAXIMUM effort with 10 seconds of rest, repeated 8 times in total. Tabata used this specific protocol to train the men’s Japanese Olympic speed skating team, and found that it significantly improved subjects’ anaerobic and aerobic fitness levels more than hour-long endurance sessions did. Pros: Also a super efficient way to burn a lot of calories in a very short amount of time, also creates a metabolic after burn effect – all in just 4 minutes. Cons: The effort required to perform a true Tabata interval is pretty excruciating – we’re talking all out, on the verge of not being able to breathe at all, maximal effort. And, since 20 seconds is super short not only do you have to push to the brink during the entire time, you also have to blast up your intensity right off the bat (there’s no time to climb into the interval here) – this is balls-to-the-wall effort from start to finish. Recs: Start out with a single Tabata session (to make sure you really want to do it! ), slowly working up to one weekly session as you become more fit. Advanced athletes can try no more than 1-2 session per week max, and only when well rested. Due to the very high intensity nature of this training it is not recommended for individuals with any limitations or health concerns. This type of training relies solely on your aerobic system for energy, and doesn’t require such extreme levels of exertion. Walking, jogging, swimming, etc. – any activity performed at a moderate level of exertion (that won’t leave you breathless) is an example of this type of cardio conditioning. Pros: This type of aerobic training helps build your overall fitness level, aerobic capacity and endurance (a great foundation of fitness to help you perform your best during HIIT style training), it also often comes with a lower risk of injury, higher enjoyment level and may even help you eat less and sleep more soundly. Cons: In terms of calorie burn, it may not be the most efficient way to go as you’ll have to go further, longer to burn up the same amount of calories expended in a shorter HIIT or Tabata style session. Recs: This type of exercise can be done daily (if preferred) since it does not overly tax your energy systems. General recommendations include 150 minutes (or about 20 minutes a day) of moderate aerobic exercise per week. The bottom line? Don’t ditch all of your lower intensity cardio sessions. High intensity interval training does have its benefits; it just shouldn’t take over your every workout. How often you decide to go high intensity should be based on your larger, longer-term fitness goals and incorporated into a plan that is best for your body. Looking for a balanced workout plan that includes the right amount of HIIT and steady state cardio training (plus completes your routine with strength training, flexibility and even injury prevention work) without straining your joints? Be sure to check out our “Walk STRONG: Total Transformation 6 Week System.” This 6 week plan has everything you need to start and stick with a regular exercise program from the comfort of your own home! Thank you for shining a light into a mayhem of different information there is. Thanks for posting these informative articles Jessica… Truthfully I just trust that any of your videos that I do I will ultimately benefit from, whether it’s hit, strength, cardio, etc. etc.